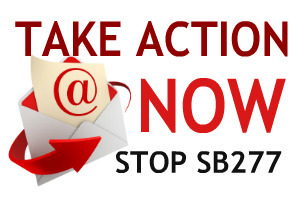 SB277 Forced Vaccinations opposition is about RIGHTS! The US has the highest vaccination rate in the western world, yet has one of the highest infant mortality rates, as well as one of the sickest chronic illness rates in children. Coincidence? Vaccines contain toxins such as formaldehyde, aluminum, dyes and disinfectants (read the inserts). When you multiply the chemicals by 49 doses of vaccines by the time a child is 6 years old, it’s no wonder our children are sick. Vaccines are pharmaceutical products that cause injury and death for some. The United States Government has paid out more than $3 billion dollars to vaccine victims. Many more people have adverse reactions. Nobody can predict who will be harmed from vaccines. The Depart of Justice issues a report on vaccine injuries and deaths every quarter to the Advisory Commission on Childhood Vaccines. The March 5, 2015 report states that there were 117 cases for vaccine injuries and deaths compensated from 11/16/2014 to 2/15/2015. Five of those settlements were for deaths linked to vaccines, three deaths related to the flu shot. Just one of many, many tragic stories that beg the question - if its SAFE and EFFECTIVE then WHY does .75 cents of every vaccine get funneled into a fund to pay for death and injury cause by vaccines? I was 13 years old when I found my 2 year old brother lifeless in his crib. The memory still haunts me to this day. I have two children ages 12 and 8 both of which have never been vaccinated. I am fearful should California remove our philosophical exemption. Seeing what my mother is going through to try to get a “medical exemption” what will the rest of us do that want to obtain one for our children? After the death of my brother, Zachary, my mother had two more sons who are now ages 18 and 16. Both of which have never been vaccinated. They are both very healthy and smart.